Pioneer Plaza, located in downtown Dallas’ Convention Center District, honors the 19th-century cattle drives on the Shawnee Trail with a bronze sculpture of 49 longhorn steer driven by three cowboys on horseback. With a waterfall and artificial cliffs, the park is one of the most popular tourist spots in Dallas. 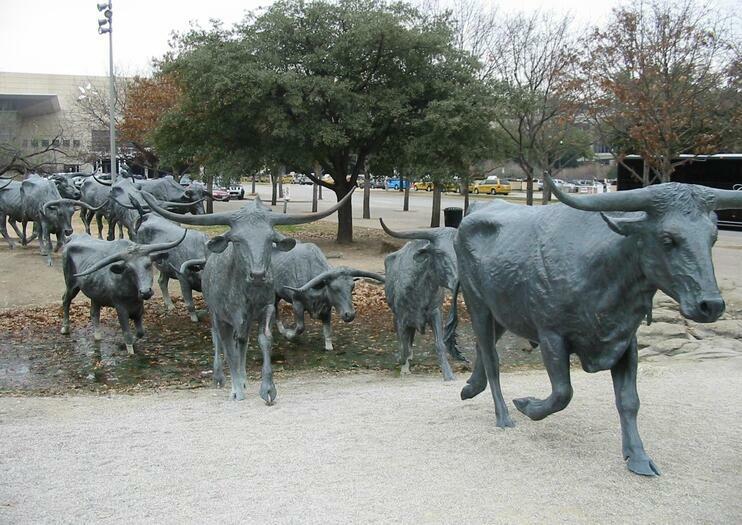 The highlight of Pioneer Plaza is the larger-than-life bronze cattle-drive sculpture by Texas artist Robert Summers. The steer, each of which stands 6 feet tall (1.8 meters tall) and contains realistic details, appear to be traveling across a flowing stream, roaming the Texas landscape just as they did in the 1800s. Several guided tours stop here to allow you to take photos and learn more about the area’s history. Pioneer Plaza is a must for families and a worthwhile Dallas photo stop. The park is open to the public every day from sunrise to sunset. It’s possible to walk among the sculptures, but wheelchairs will have to traverse grass, dirt, or gravel to reach them. Pioneer Plaza covers 4.2 acres downtown at Young and Griffin streets, near the Kay Bailey Hutchison Convention Center Dallas and adjacent to Pioneer Cemetery. Within 1 mile (2 kilometers) are such major attractions as the Sixth Floor Museum, Dealey Plaza, and the Dallas Museum of Art. The park is easily accessible by car, less than one-half mile (0.8 kilometers) north of Interstate 30. By public transit, take a DART bus to Young and Griffin. For the best photos, visit Pioneer Plaza during the day. The sculpture is a popular photo spot, and weekdays are less crowded than weekends (watch for tour buses unloading here). Spring and fall offer the most pleasant temperatures for visiting Dallas, while peak summer heat makes for some hot bronze statues baking in the sun. When the sculptures were first installed in Dallas in the mid-1990s, local residents caused an uproar over their historical inaccuracy—neighboring Fort Worth, not Dallas, claims the “cowtown” heritage. A group of local artists even tried to bring a lawsuit to stop the project from moving forward. Today, however, the statues are so beloved by visitors that they are the second-most visited site in Dallas (after Dealey Plaza). See the top sights of Dallas in a short time on this private tour. Head to Pioneer Plaza, and the Arts District, and take a walk on Main Street. When you visit the historic West End and Dealey Plaza, learn more about the assassination of President Kennedy in 1963. You can also get photo ops of historical buildings and picturesque homes on a tour that includes airport or hotel pickup and drop-off.